Do you remember that Saturday in Melbourne where it rained bucketloads? I do, all too well. A bunch of us decided that we’d ride our bikes from the CBD to Black Rock-based brewery True South. It’s a 22km ride or so and the ultimate reward at the end of a ride is the promise of good beer and nosh. Yep, undoing all the good work you just rode. Our beer-and-bike crew for the day was Brenton, Caz and a former workmate of Tristan’s, C. I was easily the least experienced rider on this trip. Still, I recommend trying it – Beach Road is pretty flat and not too nerve-wracking. Seeing as we got in pretty early, some folks hit up the breakfasty offerings. Brenton went the toastie, which looks distinctly un-toastie-like. Pretty, nevertheless! 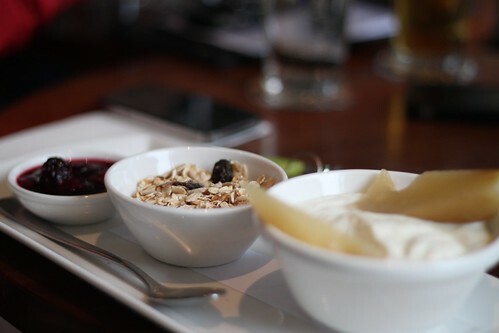 Caz went with the granola, which tempted me initially. Everything came in separate bowls and you mixed it about to your personal preference. Mmm. The rest of us tackled the lunch menu. 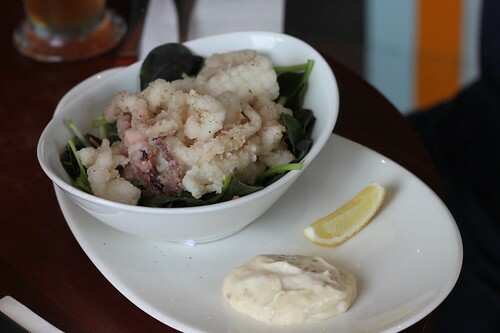 C went with a serve of the salt and pepper squid. Quite a classic: when it’s done well damn does it hit the spot. C seemed to enjoy it. Tristan went with the True South signature burger. 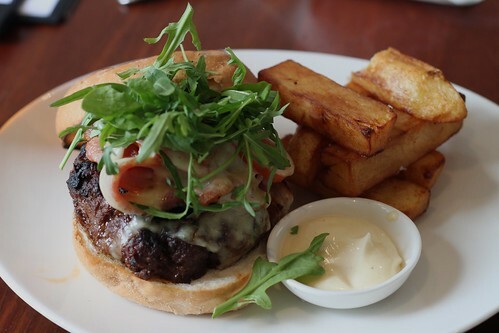 Look at those hand cut chips and that massive patty! 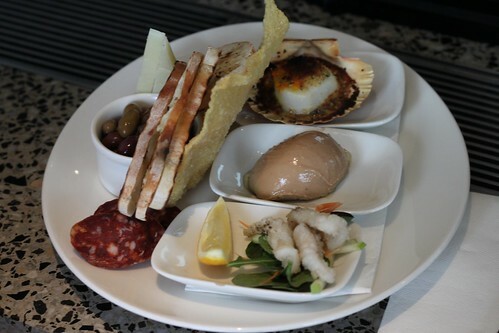 I went with the local footprint tasting plate – it had all sorts of things that you could get on the menu in greater quantities, such as the salt and pepper squid, the parfait and scallops. There was also crackers, olives and cured meat. Absolutely delicious, really loved it. By the time we were finished with our food, it was most definitely beer o’clock. Caz doesn’t really drink beer and was delighted to see that the new Little Miss Muffet cider was available. It’s crisp, very clear but I’d personally like it with a little more of a pronounced apple taste. When Melburnian summer finally arrives, this’ll go down a treat! 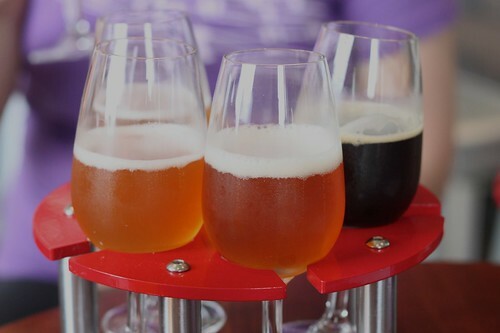 For those of you who can’t decide what to try, why not go the whole range and get a tasting wheel! This had four of the brewery’s regular suspects, plus a very special taste of their seasonal single batch whose name is debated…I personally like the idea of it being called Mervyn, giggle. The regular brews are the New World pilsner, a dark ale, a pale ale and their summer ale. My faves out of the tasting wheel were the dark ale (probably because it was such a cold day! ), the single batch and the summer ale. We’d just missed out on their wintry Wee Jimmy which I’d previously sampled at an Ale Stars session. 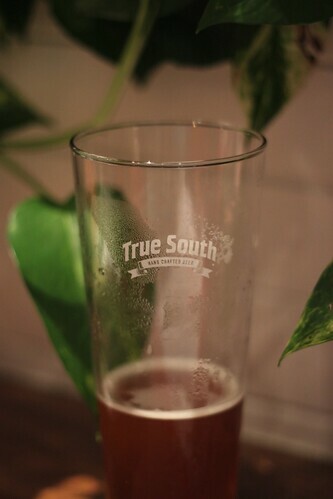 I wish True South weren’t so far as I’m really wanting to visit again. 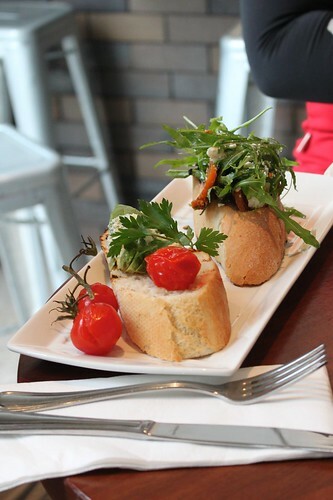 The brewery is spacious and modern and the food is absolutely to die for! Choosing items from the menu was quite difficult. Of course, you should definitely go for the beer too! I was actually lucky enough to be served by the head brewer Sam but didn’t give her the Spanish beery inquisition as we were all there to just chill out (or I was too exhausted from riding, you choose). Eventually, Melbourne cracked the shits and a torrential downpour hit us when it came time to leave. To give you an idea of just how wet it was, we cycled 3km to the nearest train station and everyone’s shoes leaked all over the train carriage floor. Thanks so much to C, Brenton and Caz for their lovely company and not minding having their food photographed by some food blogging wanksters. Incidentally, Brenton and Caz are very with it when it comes to the whole photographing thing being passionate live music photographers. You can catch them on We Shoot Bands. If you don’t believe me, check out this fantastic interview Caz did a while back for FasterLouder: these kids are a big deal! This entry was posted in craft beer goodness, eatie-foodies dining out and tagged Black Rock, craft beer, Melbourne, Sam Fuss, True South Brewery, True South dark ale, True South Little Miss Muffet cider, True South New World pilsner, True South pale ale, True South single batch, True South summer ale, We Shoot Bands on November 19, 2010 by gem. Ok, I must try that signature burger! It looks brilliant…! Can’t believe I still haven’t done True South. Well, actually, I have yet to be bowled over by any of their beers. As much as I find them all very drinkably enjoyable, they haven’t quite excited me with the awesome-craft-beer-shivers. Ohhhh! So that’s CazTheTurtle! I’m sure we’ve seen her around at plenty of gigs…because we’re total camera purves, so we often recognise the regular gig photographers. She’s probably even taken several FL “crowd people” shots of us. Love her photo work! Caz is ridiculously talented, ain’t she? 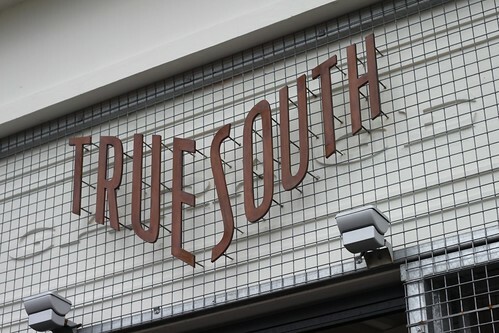 agree – i want to try that True South signature burger too!! though luckily its not as massive as the one i had in bendigo LOLz, so if i were to cycle there, i won’t have a food coma and then be stranded with my bike HAHA. The food is pretty damn good – not sure that I could finish the signature burger though perhaps at the beginning of the year when I was more of a piglet! Sorry but things have gone soooo downhill in the kitchen since your blog was written. 10 of us came for dinner and didn’t think too much of the meals put in front of us. Fish and chips for example which you really can’t stuff up was way too over-priced considering it was virtually all chips, the fish pieces were tiny and mostly batter and no garnishing whatsoever. Not even a salad. I could go on but to sum up.. Not good at all, which is a shame because we heard good things. Local RSL bistros get it right better than True South. Sorry! Sorry to hear that, Foodie. What did you have other than the fish and chips which was so disappointing?